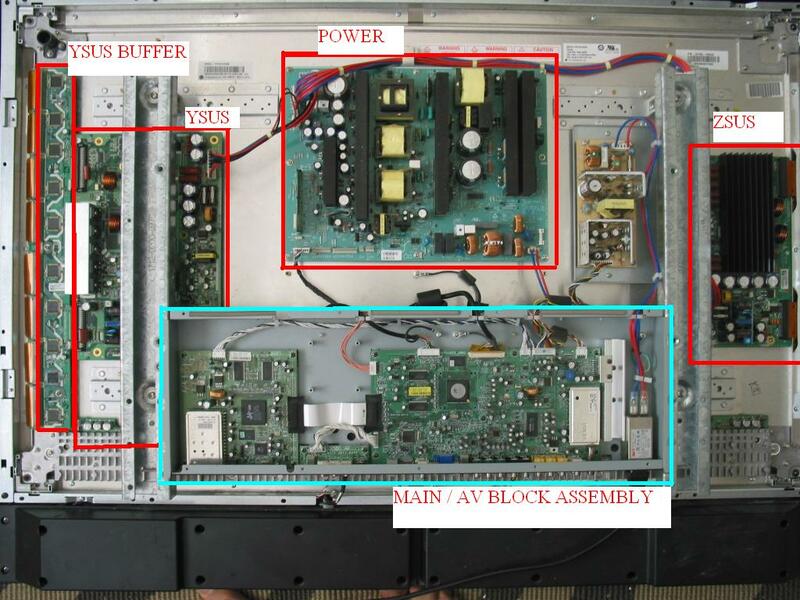 People often ask me how to uninstall the YSUS board 6871QYH053B (or some of its compatible models - 6871QYH048B for example) from their 42'' plasma TV. 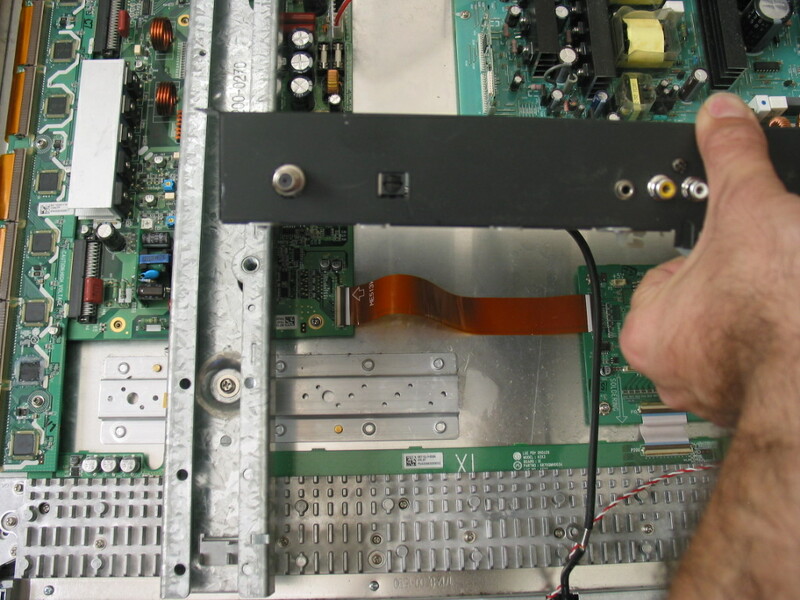 Coppell TV Repair services those boards and the question is natural considered we expect you to send us the board for repair. This is a really quick tutorial that is board-independent and TV model independent. 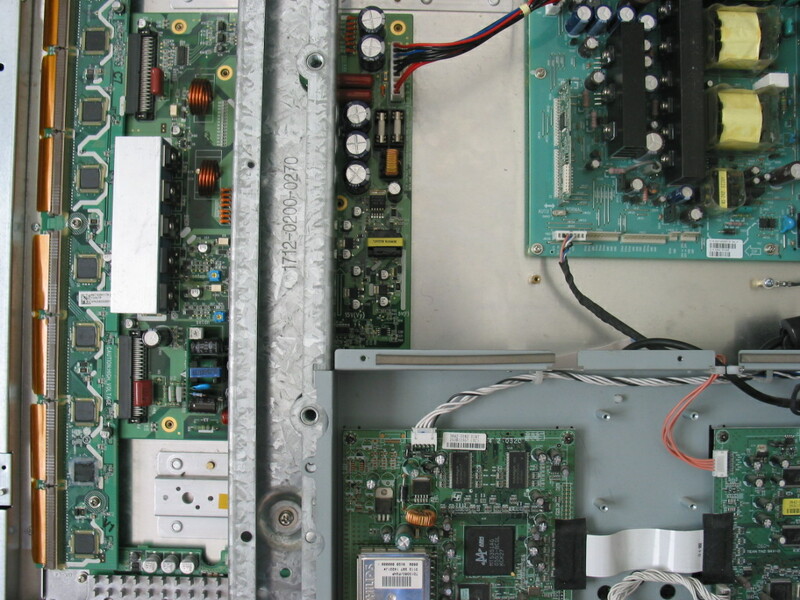 It is important to say that while different board models do not have any differences in regards to dismantling procedure, the TV models may make it a bit different as to how do you get to the board. Again, this short guide is aiming at all models and I will point out where differences are expected. To uninstall the board, first lay the TV flat on the floor, face down. Unscrew and remove the base, as most of the time it gets in the way. Sometimes it does not, but we usually remove it when we work on a TV. On all plasma TVs that I have seen the YSUS is on the left and the ZSUS is on the right. They look differently in different makes and models, but they are always left and right and YSUS is always a bit bigger than ZSUS. Otherwise they share a lot of functionality and, logically, appearance. 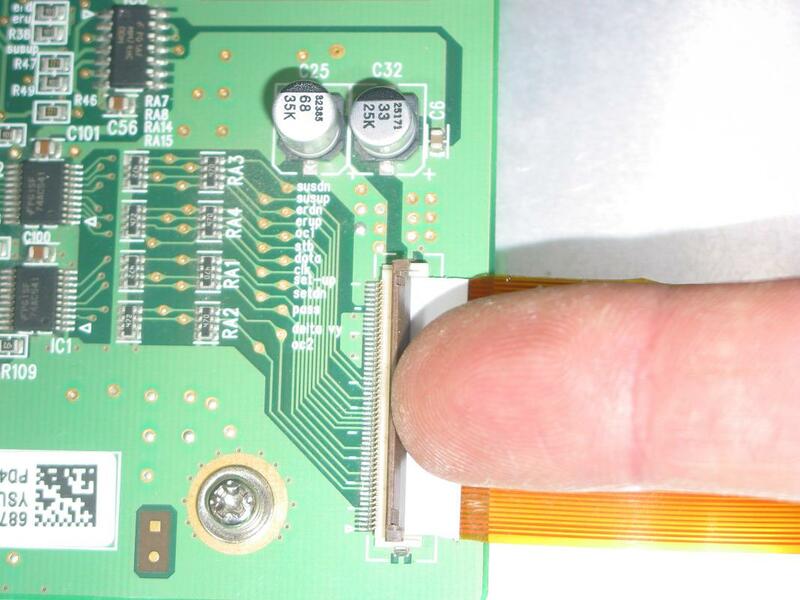 Anyway, the trick to pulling out the YSUS is usually getting access to the lower right corner of the board where there's a screw in the corner and - in this case - a very fragile flat ribbon cable connector. In this case, there were two bolts on each side that were holding the assembly, plus three more on the bottom that were holding an L shaped metal supporting the assembly by tying it to the chassis. In your case this may be slightly different and in some cases you may also need to remove the vertically standing support bar used for both wall mounting and construction support. At least we've done it a few times but most of the times - possibly always - you can get away without having to do that. As I said what you're aiming at is access to the lower right screw of the YSUS board and, of course, the fragile connector P8 just above it. Again, it is OK that your cable is white and ours is not. We're the pros, we can afford better cables, wink-wink. 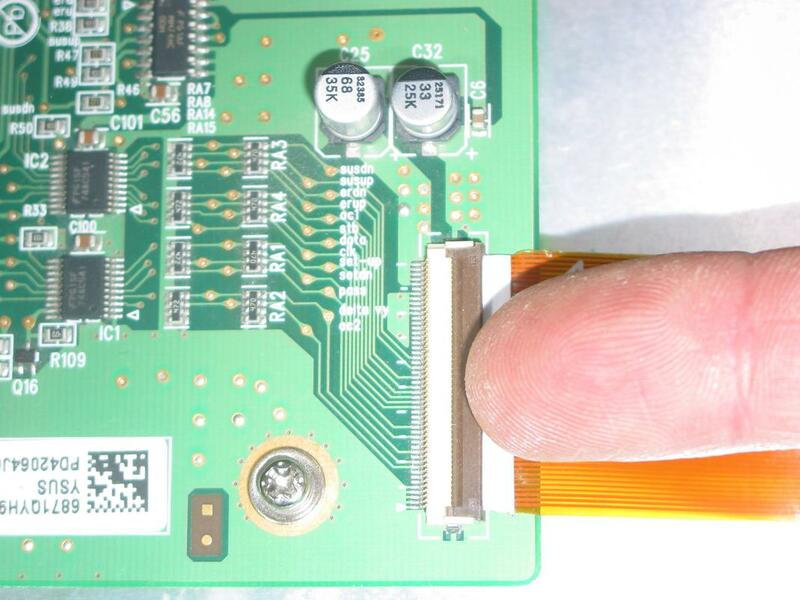 The cable in your TV will likely be white and not orange-brownish as in our picture. Do not pay attention to the color and please do not call to ask if that is a sign of anything. It isn't. 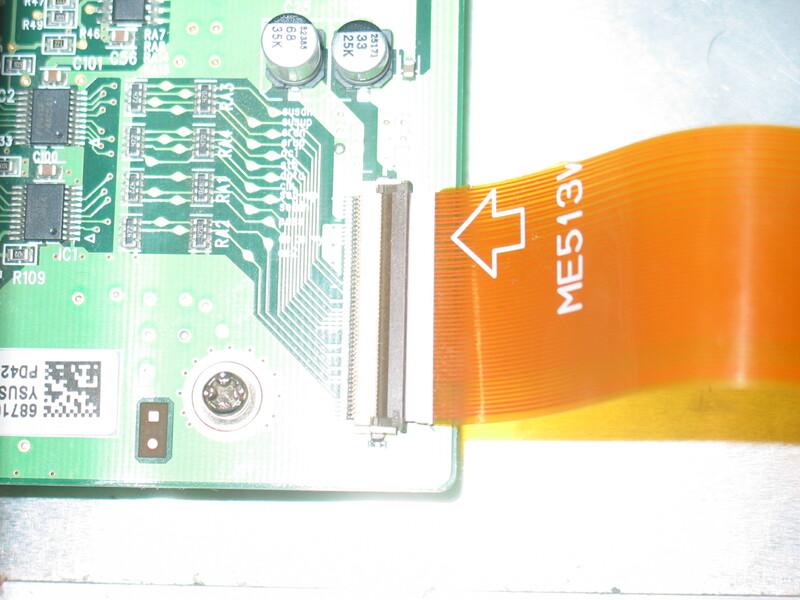 To uninstall the cable, you need to flip the right side of the brown plastic covering the flex cable so that from horizontal it turns vertical. The hinges are at the ends on the left side and are extremely fragile. If you can't make a difference between the two pictures, look at how the brown cover is already flipped up on the second one. The trick for me is to have relatively wide access of the force that pulls up and to also push a little bit inwards in addition to upwards. Wide contact is necessary so that you actually make the whole length of the cover to wish to turn up. If you apply force only in one point in the middle the brown cover will likely bend and break the hinges. So if you are using a screwdriver make sure you get one with wider tip. A great idea is to use two fingers if you can do it - pointing and middle finger work great.